Saginaw Bay Fishing on the inner bay was slow as the water is still muddy. When they could get out, boat anglers found a few walleye around Spoils Island when vertical jigging or trolling northeast of the island. Bass anglers were fishing around Bay Port and in the Pigeon River but catch rates were very slow. Walleye fishing in the Quanicassee River was slow. Saginaw River Boat anglers out of Smith Park caught and released a good number of freshwater drum, catfish, white bass and carp but very few walleye. Tittabawassee River walleye fishing was harder this year as it appears heavy rain in April flushed a lot of walleyes down the river and back into the bay before the season opened. 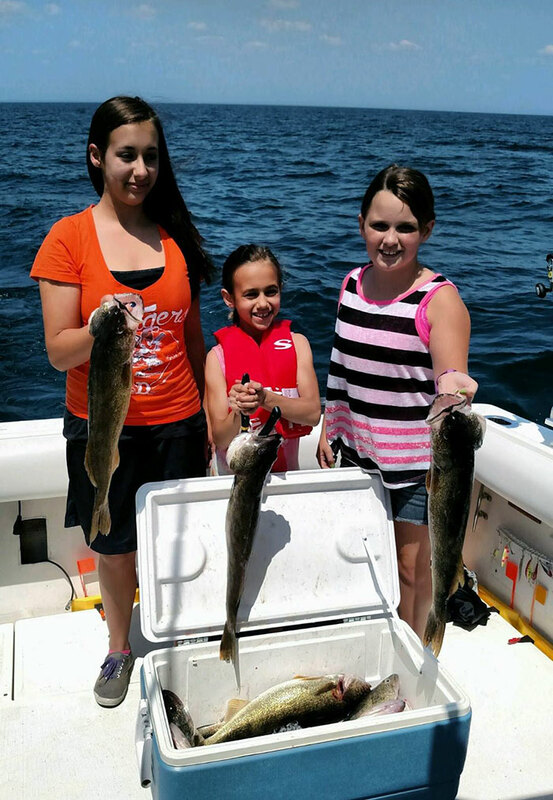 Just about everyone caught fish but limit catches were rare. Fishing was poor up near Dow Dam, but better from Immerman Park down to M-46 and beyond when targeting the deeper holes near the bridges. Anglers were trolling purple, fire-tiger and chartreuse shad raps or vertical jigging with jigs tipped with crawlers, minnows or plastic bodies in orange, fire-tiger and chartreuse. Water temperatures were a bit over 60 degrees and the white bass run is underway which is about two weeks early. 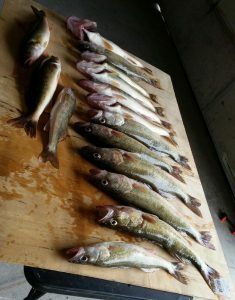 A good number of walleye got over the Dow Dam during the high water levels and provided good fishing between Emerson Park and the Sanford Dam. With the water levels rising and muddy, the river will be hard to fish for the rest of this week. Au Gres those trolling caught walleye on body baits and crawler harnesses in 15 to 20 feet off Whitestone Point, Point Lookout, Pointe Au Gres and off the river mouth. Au Gres River shore anglers fishing the lower river caught freshwater drum, bullhead and a few pike. 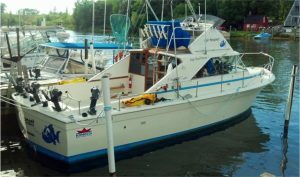 Oscoda those casting spoons and body baits from the pier caught Atlantic salmon and lake trout. Walleye were taken on jigs tipped with flukes and twister tails. Pike were hitting on jigs and crank baits. Those out trolling caught a couple walleye on crank baits in 10 to 20 feet. Au Sable River walleye were caught by those trolling crawler harnesses below the US-23 Bridge. Shore anglers in Oscoda caught smallmouth bass and carp on crawlers. The majority of steelhead were found upstream by anglers fishing egg flies, beads, and spawn sacs near Foote Dam, Rea Road, the Au Sable Overlook, and Whirlpool Access Site. White suckers are also being caught by anglers targeting steelhead. The North Branch had a Hendrickson fly hatch and some brook trout hitting the surface. The warmest part of the day was best. Tawas Area boat anglers heading down near Alabaster, the Singing Bridge and Whitestone Point and trolling body baits in 15 to 20 feet caught a few walleye. Atlantic salmon were following minnows in and out of the harbor. Pier anglers caught walleye and pike. Tawas River, the lower river provided a mix of large and smallmouth bass for catch and release along with the odd walleye, pike, carp, suckers, and steelhead. Those casting lures caught the bass, pike, and walleye while those using worms caught carp and suckers. Those drifting spawn found a couple steelhead. Many anglers search for the latest tips and tricks when fishing for trout and one of the best may also be the most simple: don’t forget that trout can see! • Cast out far ahead of you to prevent the trout from seeing you. • When wading, do so carefully and avoid rapid movement which could spook the fish. • Don’t wear any shiny objects; including watches or tools on your vest. • Stay away from wearing bright colors, stick to dark browns and greens. • Remember that trout usually face into the current so cast upstream. To learn more about fishing for trout in Michigan check out the DNR’s Michigan Fish and How to Catch Them website.